Audi is in a phase of its brand development where building as many derivatives as possible is a priority. 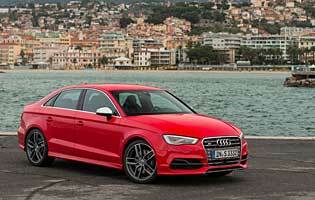 The Saloon is the third version of the S3, following three- and five-door hatchbacks and preceding a convertible. Each version differs slightly in its dimensions, level of practicality and target audience, but they each share the same drivetrain. The S3 is primarily a performance car, built to thrill its driver and provide a measure of the acceleration and speed provided by the marquee RS models at a more affordable price. The saloon variant is a new addition to a range that has previously only consisted of hatchbacks and convertibles, and adds what some buyers will see as extra prestige. The market sector is a growing one, and recently Audi's main rivals, BMW and Mercedes, have also introduced high-performance compact saloons. To differentiate itself from the competition the S3 attempts to combine ferocious acceleration and grip with subtle styling and a more refined air than its rivals. 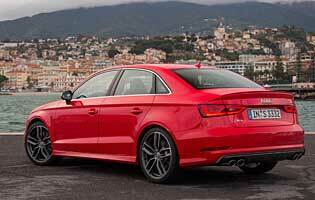 Four-wheel drive is standard, as on all Audi S and RS models. S3 models have been popular for a long time in the UK, loved for their surefootedness and all-terrain speed as much as their premium build quality and badge appeal. Audi believes more in evolution than revolution, and in truth its past sales figures show that it got the balance of qualities in the car right in its first incarnation. This latest model, with its particularly appealing 'three-box' proportions, carries on the tradition in examplary fashion, with higher-quality materials, more efficient and yet more powerful engines, and plenty of advanced technology both in terms of performance and safety. 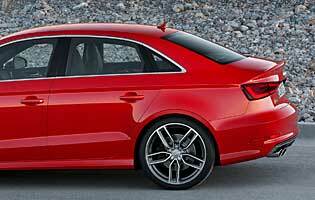 However, as a halo model for the A3 line it is not likely to contribute large sales volumes. There can be no doubt that the S3 is very fast, and is capable of exploiting its performance in almost any conditions thanks to the latest generation of quattro four-wheel drive and advanced torque vectoring technology. It's actually very difficult to step beyond the car's limits and therein lies a large part of its appeal, but as ever the joint bonuses of materials quality and style complete a convincing package.